Zusätzliche LP-Details angeben? Verwenden Sie Kalkulator Knopf oben rechts auf dieser Seite. Welche Lötoberfläche passt zu Ihrem Design? https://www.eurocircuits.de/wp-content/uploads/Selecting-Surface-Finish.png 898 1528 Marianne De Wolf https://www.eurocircuits.de/wp-content/uploads/2016/07/eurocircuits.png Marianne De Wolf2019-04-14 09:58:362019-04-15 17:50:46Welche Lötoberfläche passt zu Ihrem Design? Sponsoring GreenTeam Uni Stuttgart e.V. https://www.eurocircuits.de/wp-content/uploads/Bild1788.pg_.jpg 1130 1682 Uwe Dörr https://www.eurocircuits.de/wp-content/uploads/2016/07/eurocircuits.png Uwe Dörr2019-01-21 18:43:512019-01-21 18:43:51Sponsoring GreenTeam Uni Stuttgart e.V. IOTEAM S.r.l. is a company in the area of wireless technologies: we develop innovative IoT modules and boards, but we also offer the services of complete product design and production. That’s why we need the fast, on-time and high quality services that Eurocircuits offers, both for our prototyping and production needs. Why choose eC-stencil-mate and eC-reflow-mate? INNORA is an engineering consultancy company, employing our expertise in service robotics, machine learning, and embedded systems to offer tailor made solutions across industries and markets. We act as the extension of your innovative lab, capable of designing, testing, and crafting working prototypes. As I told you by phone, I first came across EC 4 years ago now, as a student in France. I wanted to make a development board for Mbed ARM µController, it was a 8 people project, we did it, EC printed it, and it was great, great service. I remember we did spent a LONG time reading your guidelines at the time as it was our first time printing. Today, I submitted an Arduino shield tailored for one of our project. Anglian Electronics are specialists in the design and manufacture of embedded microcontroller-based products and contract electronic manufacturing from prototype design to complete product design and manufacture. Using eC-stencil-mate I have just populated a batch of boards in 2 hours that previously would have taken me all day. We initially talked to some UK fabricators but looked further afield when they proved prohibitively expensive. I came across a forum post (http://www.eevblog.com/forum/manufacture/low-cost-4-layer-pcb-prototyping-service/ ) that extolled your virtues and the price calculator quickly confirmed that your offers were much more affordable. Overall, we were very impressed by the website. Thank you for getting us set up, so far your service has been excellent. We started using your service via the PCB quoting tool in Eagle then via Farnell Element 14. We have previously used another supplier but you provide better value through tools and options than them. The naked-PCB option is excellent for Alpha prototypes. Our work is low volume (normally one off items) for the entertainment industry so further work is difficult to predict but we look forward to working with you again. I noticed that an order I placed earlier this week shipped a lot quicker than usual (hurrah, this is great!). It looks like it’s come straight from Hungary instead of going via Germany. Is this a new process for you? If so then brilliant – always keen to get faster turnaround but the old 2-3 day pricing just ramps up so fast I could never justify it. hatte gestern bei euch zwei Platten in Auftrag gegeben und wollte nur kurz mitteilen das der PCB Visualizer ein echt tolles Tool ist. So eine einfach und gute Lösung um einen Vorab-Check zu machen. The PCB arrived today, well before the predicted date. The quality of the board is excellent and you’ve made the process very easy from your end. I am very satisfied with the service overall and will definitely use it again for any future projects. I also want to thank you personally for your time and help. I got a surprise yesterday when I received an email from EC saying that my boards had been shipped. They arrived this morning at 09:05 ! I only placed the order last Friday – amazing for a 7 day turn around! They look good too. I’ll build one this afternoon and, all being well, put in an order for some more PCBs tomorrow. 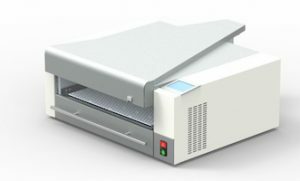 EC-reflow oven review. The Eurocircuits reflow oven makes a solid impression with respect to it’s construction. Equipped with some demo boards I made some tests to find a working temperature profile for the materials that I plan to use. I took a look into the specifications of the soldering paste and compared these with the default temperature profiles of the oven. With that I made test runs with the profiles that seemed to be most promising. Just wanted to leave some feedback for you guys somewhere that it counts.. Brilliant service, fast turn around and a keen price. Boards were fantastic, lovely quality and soldered up a dream no pad or track lifting. I was about to go elsewhere when I started looking, simply because of being unfamiliar with Gerber files (which I now love and can see why you prefer them) I was at the time just being lazy and looking for an easy option one button solution which probably would of ended up with bizzare track sizes or drill holes.. The clock arrived today, I have assembled it and it is sat working, waiting for me to decide where in the house to locate it. It is a wonderful clock and I hope you sell them in great numbers. If you are able to pass on my appreciation to the designer, please do so. I am a member of a technical support team in a British University and we regularly use Eurocircuits as our printed circuit board manufacturer. Since we have our own PCB prototyping facilities we only use a commercial PCB fabricator when we require a professional finish, a complex multi-layer design or quantity. We find that Euocircuits Standard pool service provides everything that we require, easy to order, cost effective and prompt delivery. I noticed that an order I placed earlier this week shipped a lot quicker than usual (hurrah, this is great!). It looks like it’s come straight from Hungary instead of going via Germany. Is this a new process for you? If so then brilliant – always keen to get faster turnaround but the old 2-3 day pricing just ramps up so fast I could never justify it. Still exceptionally happy with the service overall – Eurocircuits is by far the best prototyping service I’ve used (and worth the extra cost compared to other options I’ve tried).